Due to experiences of overwhelming stress (developmental trauma), the teens Calo works with have some core beliefs about themselves and the world they live in. At their core, they believe the world is an unsafe place. They typically experience themselves as alone, inadequate, and socially clueless. Because of developmental trauma, the teens we work with have not developed secure attachments and that has affected their core beliefs about the world and themselves. For example, many of our students don’t experience the world is a safe place, so they approach the world like the Lone Ranger. They rely only on themselves and shun relationships. They also believe they are bad, and that’s why they’ve been abandoned, neglected, or abused. These beliefs produce shame and within the context of school, they explain their school difficulties simply with, I’m stupid. Calo’s remedy to this belief system and the painful situations that arise from it is relationship. Because the developmental trauma these children suffered was created in an absence of secure relationships, it can only be healed in secure relationships. At Calo, we summarize our relationally-based treatment model as CASA, which stands for Commitment, Acceptance, Security, Attunement. The ultimate goal of the model is Joy, experienced through co-regulation. 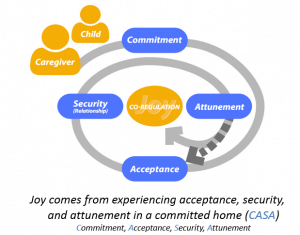 Joy comes from experiencing acceptance, security, and attunement in a committed home (CASA). We begin with Commitment on the caregivers part. For us, that is the parent, guardian, or primary attachment figure which commits to sending their child to us and commits to working with us in the goal of reuniting at treatments end. It begins also with our commitment as caregivers to treat the child, to go the distance, as we say here. We have made this seem more linear in theory than it is in practice. In action, this tends to be, as the graphic shows, a recursive process of progress and regression, rather than a straight line of progress. That Commitment needs to be coupled with Acceptance. Acceptance by the parent and by us as caregivers can be a complicated process, but at its fundamental level, it is a recognition that developmental trauma and attachment insecurity is driving the child’s behavior, not attitudes, laziness, or narcissism. We have to accept that it is not a matter of trying harder for our kids, but of experiencing how to trust others and ultimately themselves. Our kids are inherently valuable. We need to see them as always doing their best. Once our kids feel accepted, they can begin to feel Secure, or Safe, both physically and emotionally. The caregiver needs to be a Secure relationship. Security is defined by predictability, consistency, reliability, regulation, and empathy along with established boundaries and clear limit setting. When teens repetitively experience Commitment, Acceptance, and Security from caregivers, they can begin to Attune with us and form a safe relationship. Attunement is based on focused attention of the caregiver where empathy and our ability to be fully present in the here and now provide experiences of trust, vulnerability, connection, and co-regulation where trauma can be transformed into manageable feelings and memories. Most importantly, attunement produces experiences of co-regulation where emotional, developmental, and relational growth flourishes. It isn’t until the child repetitively experiences attunement and co-regulation that self-regulation can begin to develop. It is only through co-regulation that we can provide the advice and strategy that we desperately, and futilely, have attempted to give our children. It is only through co-regulation that we can initiate healing, repair, and development where experiences of reciprocity and healthy intimacy can occur. We mentioned above that the goal of our model is co-regulation, an emotional state in which our kids can safely learn from adults and eventually from peers. We mentioned also above, that our model is recursive, so we have to emphasize again that this is a constant process. Co-regulation is not a steady state. Our kids will move along the cycle of commitment, acceptance, security, and attunement frequently as they encounter new experiences or re-experience some aspect of their previous traumatic history. So, while attunement is the lever for co-regulation, the ground upon which the lever sits is commitment, acceptance, and safety. At any moment of dysregulation, as caregivers, we have to go back through our model to check that we are committed, accepting and providing safety before we can accurately attune. 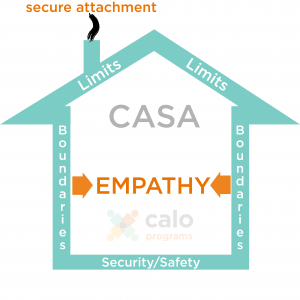 The CASA Model is the neurobiological framework for creating experiences of secure attachment.